The supposed explanatory statement issued by the president’s Special Assistant for Press confirming that Hon. Davis Chama was Acting President of Zambia raised more questions than answers. It also brings to the fore the need for an incumbent president to appoint assistants with a history and knowledge of the mechanics of public service. After a series of denials, they finally conceded that indeed Hon. 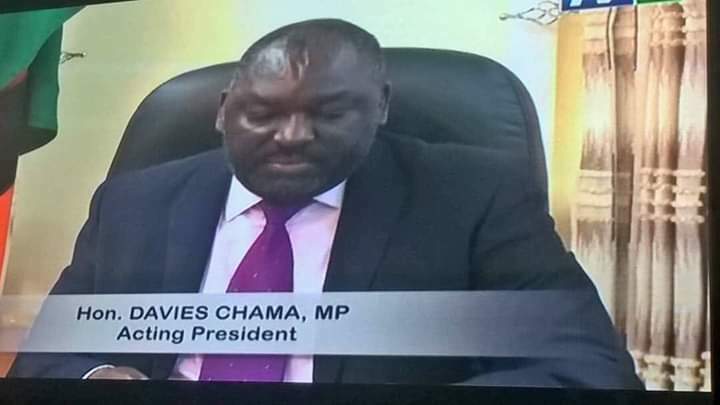 Davis Chama had been acting as president while President Edgar Lungu was on what was said to be a working holiday in South Luangwa. Our concern is that the transfer of power from an incumbent president to whoever the president feels the propensity to bequeath it to is not a private matter between two private individuals. It is the presidency we are dealing with which involves the transfer of state power to another individual. Power transfers have emotive implications especially if the other person being paid hard earned tax payers money is on working holiday within the country, whilst another person acting in the same capacity is also drawing money from the same office. Our highly indebted nation can ill afford such wanton expenditures. Precedence attests to the fact that any time there is a transfer of the instruments of power, a Gazette Notice must be issued promptly to validate the act and notify the public. Short of this, people will speculate to fill the blanks. Let us not be seen to be rewriting the time-tested protocols and procedures governing the public service which have served us without eliciting public speculation and conjecture for decades. It boggles the tax payers mind why an incumbent president who is on “working” holiday within the country would need someone to act while he is working. The “infuriation with the “high levels of misinformation, rumor mongering and ignorance (sic) is caused by an inert failure to inform the nation in good time and publishing the necessary documents. Someone who draws public funds to inform the nation about the president must forestall our ignorance, rumour mongering and misinformed minds by being proactive and following time-tested tradition. To our knowledge, or lack of it, we did not see the Gazette notice effecting the alleged transfer of power to Hon. Chama. It is this inability or unwillingness to operate in a lucid, organised and time-tested modus operandi that gives rise to the “infuriated” efforts at damage limitation. Acknowledge the inadequacies and in all future engagements follow laid down public service protocols and procedures to avoid crying wolf. Moral of the discourse? Do not shut the stable door after the horse has bolted.